【動画】 #大飯原発 3, 4号機 #運転差止訴訟　福井地裁「勝訴報告」記者会見@日本外国特派員協会（有楽町のFCCJにて）2014年6月3日、原告弁護団による記者会見と判決要旨を下記に転載（日本語と英語）。A Court Injunction Against Ohi Nuclear Power Plant – #3・#4 Reactors’ operation: Press conference held at FCCJ Tokyo on 2014/6/3 (English version attached). on 2014/6/3 (English version attached). 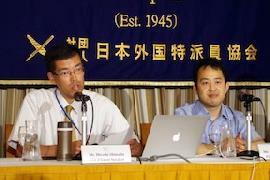 Article on 【Press Conference@FCCJ Tokyo, Japan】held on June 3, 2014, regarding The favor verdict on ‘Stop the 3 & 4 reactor of OOI nuclear power plant” has delivered by Fukui lower court on May 23, 2014. Interviewed by the working press members of foreign press in Tokyo.